little lambsie divey: Spring (roll) into Summer! This week's feature veggie is Napa Cabbage. An Asian cabbage that is perfect for kimchi, stir fry, spring rolls and more! Actually, this website explains 8 different ways to prepare and eat it up. Here is a recipe for Napa Cabbage spring rolls where the cabbage leaf is the roll! • In a medium saucepan, bring 1 cup water to boiling. Slowly add rice and return to boiling; reduce heat. Simmer, covered, until most of the water is absorbed and rice is tender. Remove from heat. Let stand, covered, for 5 minutes. Uncover; let rice cool. Set rice aside. • In a 5-quart Dutch oven, combine 12 cups (3 quarts) water and the 1 tablespoon sea salt. Bring to boiling. • Meanwhile, in a large bowl, combine 8 cups cold water and ice cubes. • Remove 8 outer leaves from cabbage. Make a cut through each individual leaf at the base where it attaches to the core. Trim out some of the woody stem area from the leaf. Set the remaining head aside. • To blanch, carefully add trimmed cabbage leaves to boiling water; cook for 30 seconds to 1 minute or until just wilted. 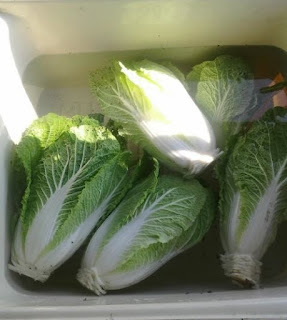 Cool quickly by plunging cabbage leaves into ice water for 1 minute. Remove individual leaves from water and lay each flat on a cloth towel to dry. Set leaves aside. • For vegetable filling: From the remaining cabbage, finely chop enough to measure 1 3/4 cups. In a large bowl, combine the finely chopped cabbage, carrots, onions, parsley, sesame oil, lime peel, lime juice, the 1/2 teaspoon salt and pepper. • About one hour before serving, assemble rolls. (These rolls benefit from allowing the surface to dry a little, so making them an hour or so in advance of serving is a good idea.) First, squeeze out any excess water from the vegetable filling. Then, on the counter or cutting board, take a blanched cabbage leaf and lay it flat, with the base end toward you. In the center of the leaf, place 1/4 cup of the vegetable filling on center of leaf, then place 2 tablespoons of the rice on top of the vegetable mixture. • Roll the base end over the rice and filling. Fold both left and right sides over so that it just covers the opening on the edges. Continue rolling toward the end, wrapping tightly with care not to tear the leaf. Place finished roll on a serving dish with the end tucked under the roll, seam side down. Repeat with remaining leaves, rice and vegetable filling. • To serve, if you like, cut each roll in half crosswise on a diagonal to make 16 pieces. Serve with soy sauce or teriyaki sauce.